Lugansk Airport. Book cheap flight tickets to Lugansk. 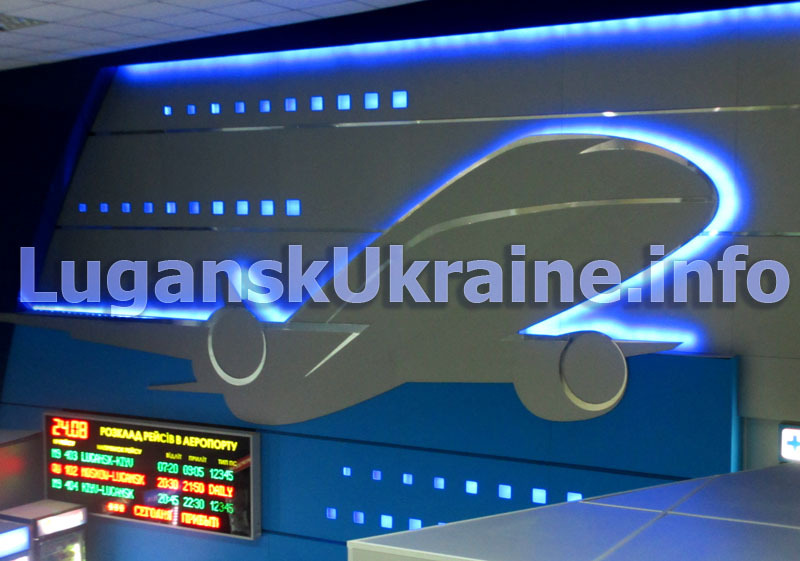 About :: Lugansk Airport. Airlines that fly to Lugansk. Flights schedule. 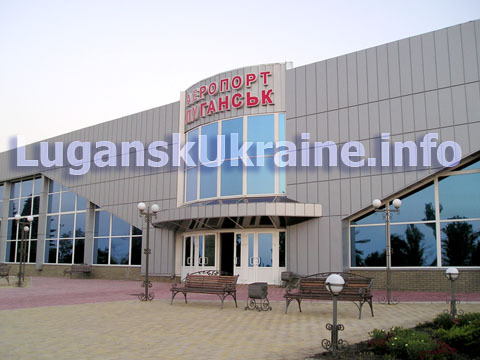 Video of Lugansk Airport from the inside and short description. For many years nobody did fix the airport after 1991, and it was in terrible condition. Everything was old and falling apart inside. And they only started to fix it in 2004 when there were new presidential elections in Ukraine to show people that government does care about them. They 1st fixed the front and it took almost 2 more years to finish everything inside. I remember the time when people were getting out of the aircraft in winter and had to walk through the snow about 100 meters passing by the airport building and look for a taxi or those who were meeting them freezing in the cold wind, almost no lights like in a scary movie. But finally the airport was fixed and now it's one of the best looking airports around Ukraine. The airport has 2 levels and the ceiling is super high, so it stays nice and cool during hot summer. The 2nd floor is not used much, it has a lot of chairs for the passengers who are waiting for their flight, few big flat screen TVs where you can watch local news, and it has a nice panoramic view over the runway where you can see airplanes landing and taking off. On the 1st floor (you also call it ground floor) there are customs, a cafe, ATM machine and ticket offices of the airlines that does the flight to Kiev and Moscow. There is no currency exchange office at the airport. But there is nicely done VIP area where you can have some rest. 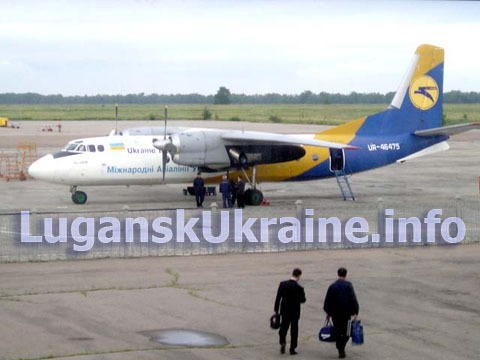 List of airlines that fly to Lugansk Airport. Right now there are only two airlines that fly to Lugansk Airport. That is Motor Shich and UTair. Motor Sich only flies to Kiev. And until 2012 they had a monopoly on those flights. UTair was only flying to Moscow, but starting from 2012 they also have a flight from Kiev to Lugansk. So now as the competition grows the price for tickets went down a lot. And you can get the round trip ticket from Kiev to Lugansk for $165 or even less. The airplanes that fly to Lugansk are not the newest ones and they are propeller. UTair airlines has newer planes. The fly from Kiev Zhulianiy airport and you can buy thickets through their website. Motor Sich flies from Boryspol airport and it is also possible to buy their tickets at their website. In summer time there are flights to Antalya city in Turkey, that is popular destination for local people for vacation at the the sea side. How to get to Lugansk Airport. The best way to get to Lugansk Airport is by taxi. The price for one way taxi to the airport would cost around $10. If somebody is coming to pick you up, budget about $15-$20 for the round trip. The airport itself is located about 19km from Lugansk city center and it will take about 25-30 minutes to drive from the airport to the city. If the weather is not good or too much traffic that can get a little longer, but usually that is not a problem, because the flights from Lugansk to Kiev and Moscow are early in the morning when the streets are empty. Same flights arrive from Kiev and Moscow to Lugansk late at night, when there is no traffic as well. Keep in mind that there can be delays with the flights if it snows a lot or if there is a fog. And if for some reason they shut down the airport, the best alternative is to go to Donetsk as they have many flights everyday, it will take about 2 hours to drive there, but the chances to fly out are much higher even if the weather is not nice. There are no buses from Lugansk airport to the city, so it's better to arrange airport transfer in advance if you don't want to get ripped off by local taxi drivers.